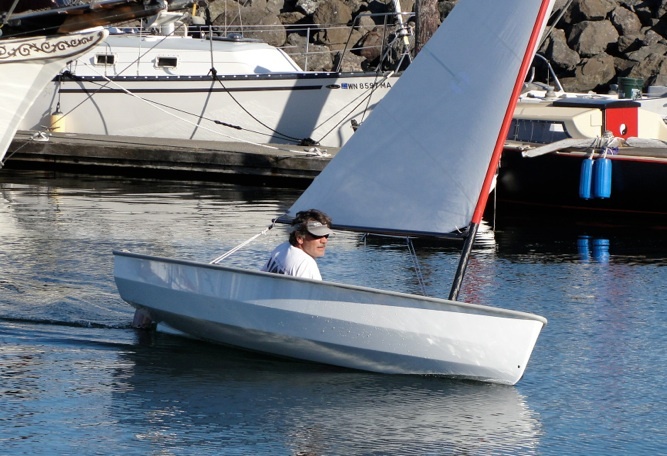 PT Watercraft PT Eleven, 11ft Dinghy is unique, efficient, functional, modern & attractive. 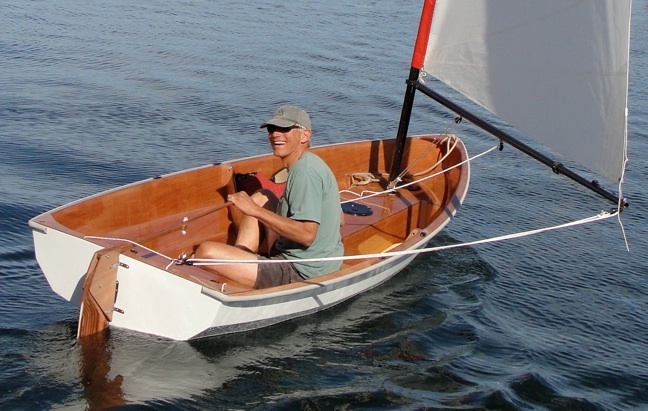 This non-nesting version of the PT11, has fewer parts, making it a simpler boat to build. Dubbed "the Spear" for its arrow shaped foredeck, the biggest differences between the non nester and the nesting dinghy are in the interior geometry. 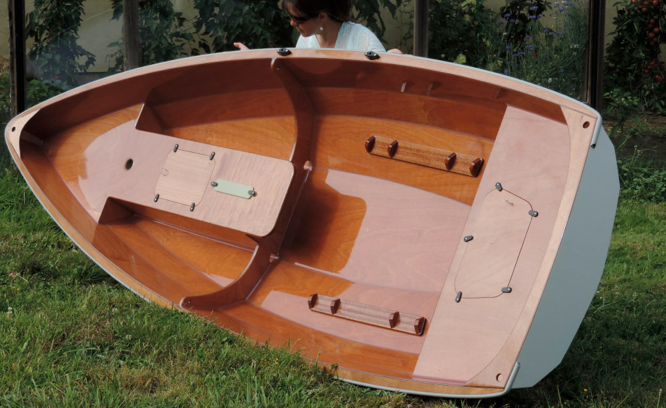 Kit includes the water tight back seat hatch kit, daggerboard trunk cap kit, and GACO oarlocks with machined Mahogany riser blocks. See our Welcome page and PT 11 home page to understand the pricing of our kits. The Spear does not have a full foredeck. A water tight hatch (an option) or deck plate works well to access storage space here. Scuppers from the forward wells through the main bulkhead are possible on the one piece version where they are not on the nesting version. The backseat is one full seat instead of divided as on the nesting version. There is a hatch in the back seat (included) giving access to a storage. There are also baffles that provide air buoyancy sufficient to balance the air buoyancy in the bow, (forward of the mast step). Air buoyancy is an important safety feature on this boat and the PT 11 nesting dinghy. The USCG has specific parameters for flotation when flooded and we have taken these seriously. Besides these differences, the hull shape is identical to the nesting version and rowing and sailing performance will be the same. The Spear base kit costs significantly less than the Nesting dinghy kit. The boat will be lighter by a few pounds. The various options, including sailing rig, offered for the PT11 nesting dinghy will be the same for the Spear. PLANS for the PT SPEAR? It would certainly be to our great advantage to have plans. Unfortunately, our boats don't lend themselves easily to being built from plans. 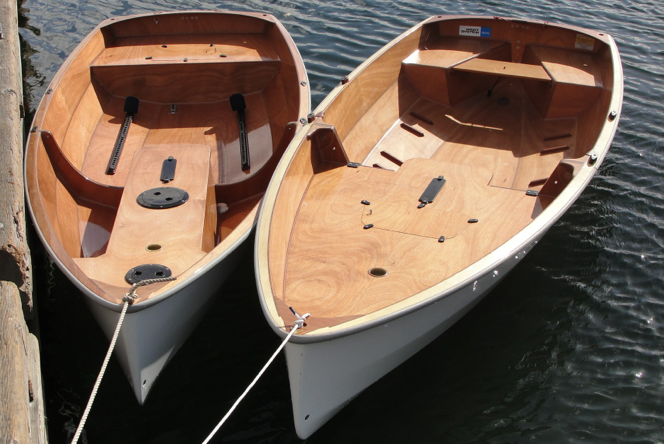 Our kits are designed in CAD from the ground up as KIT BOATS. We have really taken advantage of the kit technology using tongues and slots, scribe marks and alignment notches. There are 7 hull panels that are put together without any sort of jig (except for the bulkheads and machined gunwales). If the panels are not super accurate, then the bulkheads would not fit. Ocean freight is actually not bad. It is the port and clearance fees (+fumigation in AU) that are the bummer. Shipments of 3 or more kits can make up the minimum LCL of 1 cubic meter and really spreads out the port and clearance costs. So think group orders addressed to a commercial entity if you can. Find out what the import costs are in your country. We are also working on paper patterns to replace the lumber kit. This should exempt the kit from the need for fumigation. Recently, AIR FREIGHT has become a viable option as I continue to work with shipping agents. Canada: 12% - 13% HST. Contact me for more information. Perhaps you would like to tour the Olympic Peninsula! We can also ship to pick up locations on the US side of the border. At some point we will establish distributors in Europe and Australia but right now I have not focused on setting someone up in other places. and China. The highest quality with the least glue voids is by far the European brands. Therefore; We do not buy Chinese plywood. ✓ Two different weights of fiberglass cloth is needed for the PT SPEAR and is included with the kit. The 50” wide 4oz (x21ft) & 6oz (27ft) cloth is especially finished (F81) for use with epoxy as opposed to polyester resin. Russell also makes the fiberglass tubes used as mast steps. Other epoxy, G10, & Delrin parts are made or machined locally from stock we purchase from McMaster Carr. There is a great deal of hand work that goes into creating many little essential parts included in your kit. The Spear base kit is pictured left. The plywood panels here are stacked as are many of the parts with multiples. 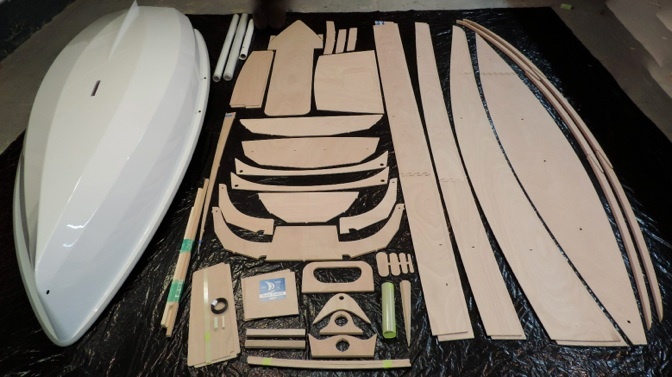 The daggerboard trunk cap kit, backseat hatch kit, and GACO oarlocks and riser block are not shown here. ORDER a manual for study here. This manual is 280+pages, mostly in photographs, with instructional text designed to teach the fine art of building with plywood & epoxy efficiently, while building the PT Spear dinghy. Prospective builders can buy the manual only and be credited the manual price upon purchase of a kit.